After a good nights sleep at Four Wynds we awoke to an overcast and mild day in Greenhead. This was to stay the same for the majority of our day today although we would get some squally showers on our approach to Saughy Rigg. At breakfast we met Ian & Rosie from Settle who were finishing off their Pennine Way having done the route in several chunks - their remaining itinerary was exactly the same as ours therefore we would see quite a lot of them over the next few days. 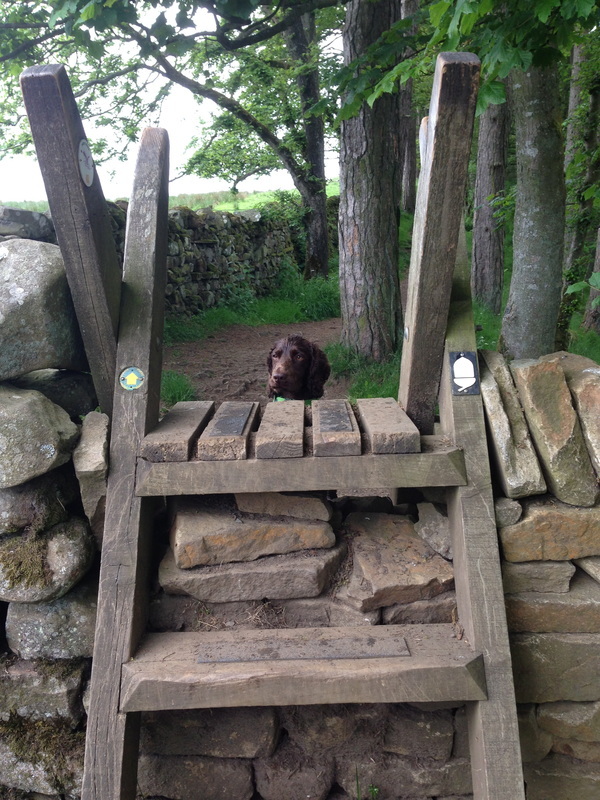 Today was a day we had been excited about ever since we had decided to walk the Pennine Way. 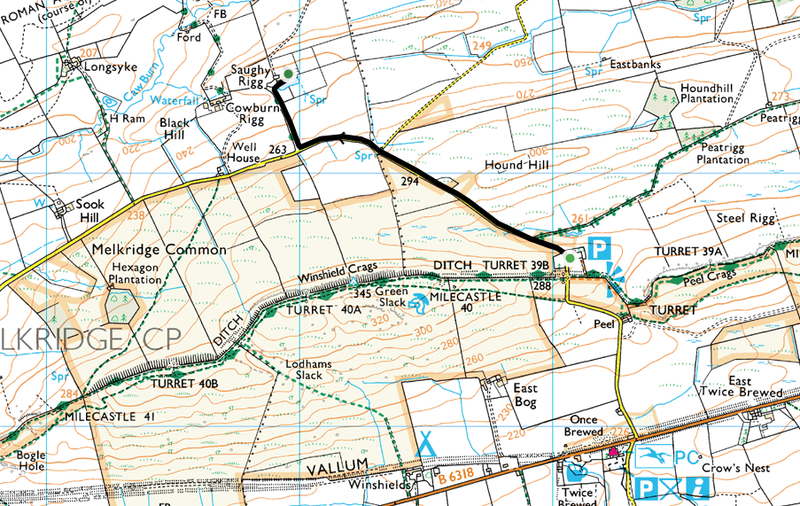 Todays route would see us join Hadrian's Wall near Thirlwall Castle and meet a friend at Walltown then walk along the wall to Steel Rigg before driving over to Housesteads to visit the Roman Fort there. We then planned to walk back to Steel Rigg and then down to our digs for the night at Saughy Rigg. 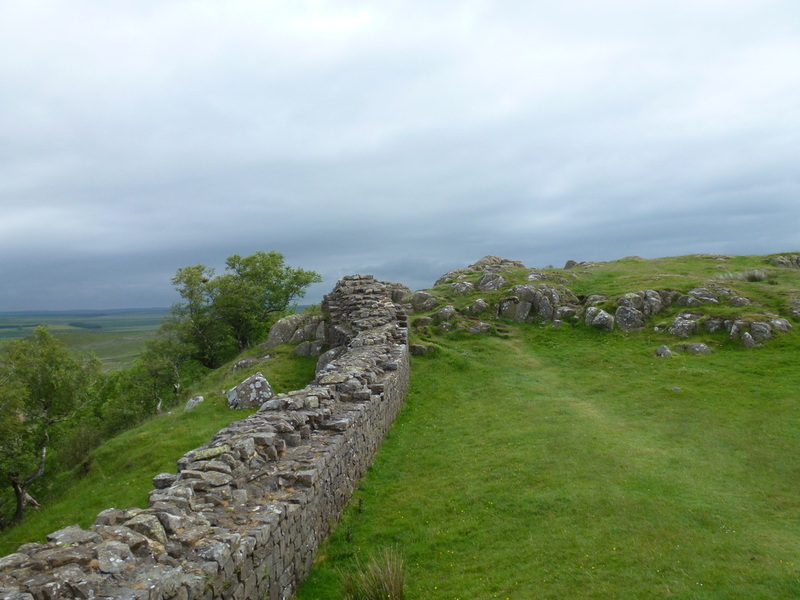 We had never visited Hadrian's Wall before and the chance to see it and actually walk alongside it was an exciting prospect. 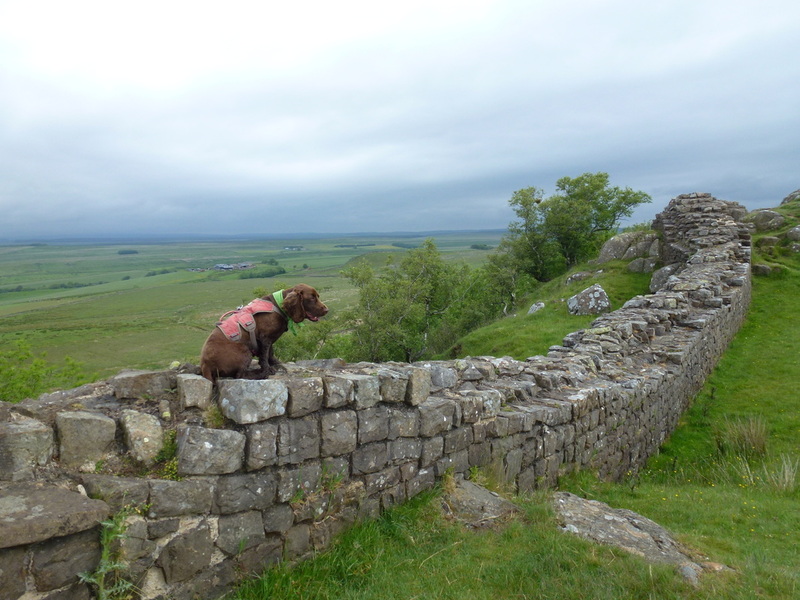 Built between 122 AD to 128 AD by the Roman Emperor Hadrian as a "defence of the empire" the wall stretches some 73 miles from Wallsend in the East to the shores of the Solway Firth in the West. 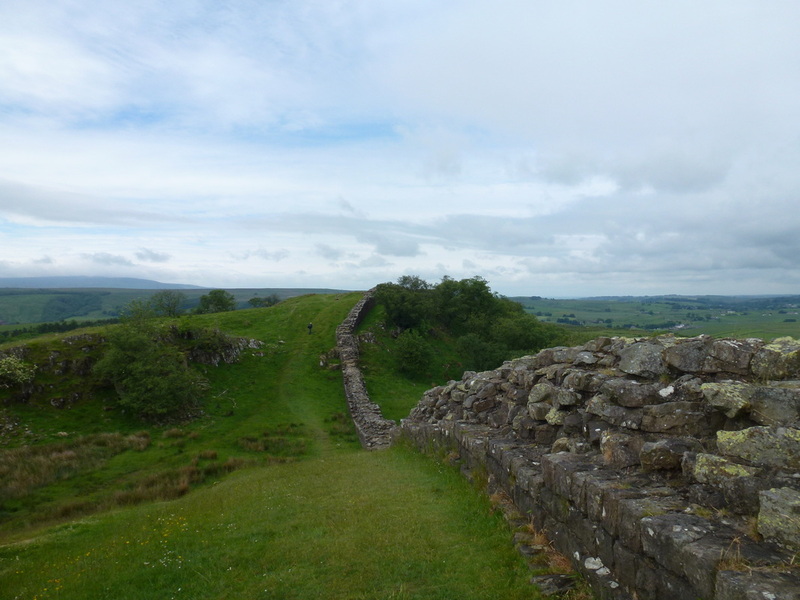 Whilst some of the wall has clearly been repaired and had some stones removed for other construction projects, there are several sections that are completely original. The wall was designated as a UNESCO World Heritage Site in 1987. 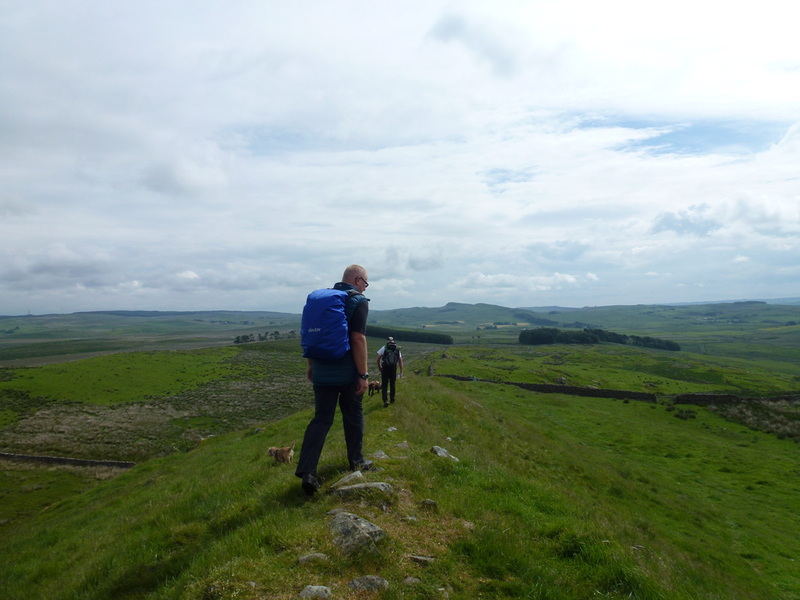 Leaving Greenhead we walked south to rejoin the Pennine Way at Thirlwall Castle. 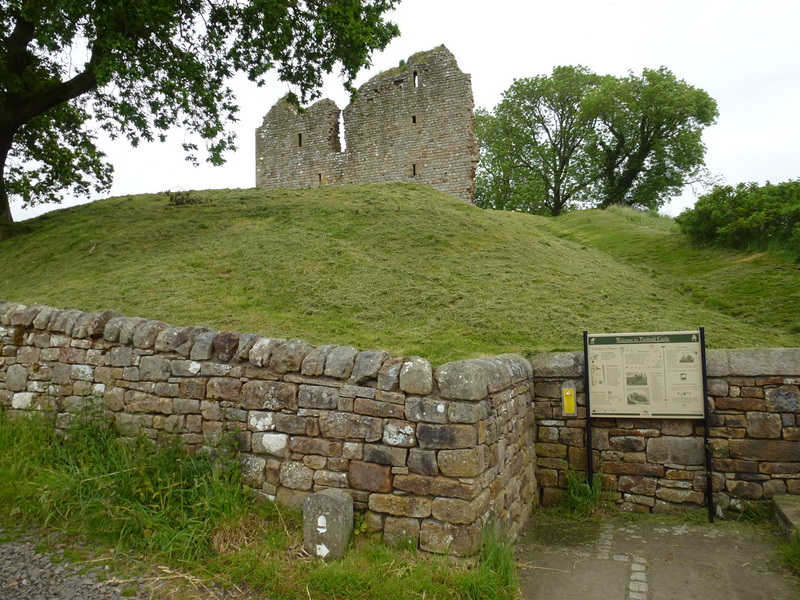 The castle was built in the 14th Century for the Thirlwall family's protection against border raiders. The path then climbed alongside a ditch to reach Walltown Quarry and just above the bench at Walltown Crags we met up with Keith who Angie had served with on HMS Northumberland and had kindly come out to join us today. He had brought his Border Terrier Heidi along too. What has cheeky boy spotted? ​From the crags the wall really showed itself and surprised us at how undulating it was - lots of steep up and down. 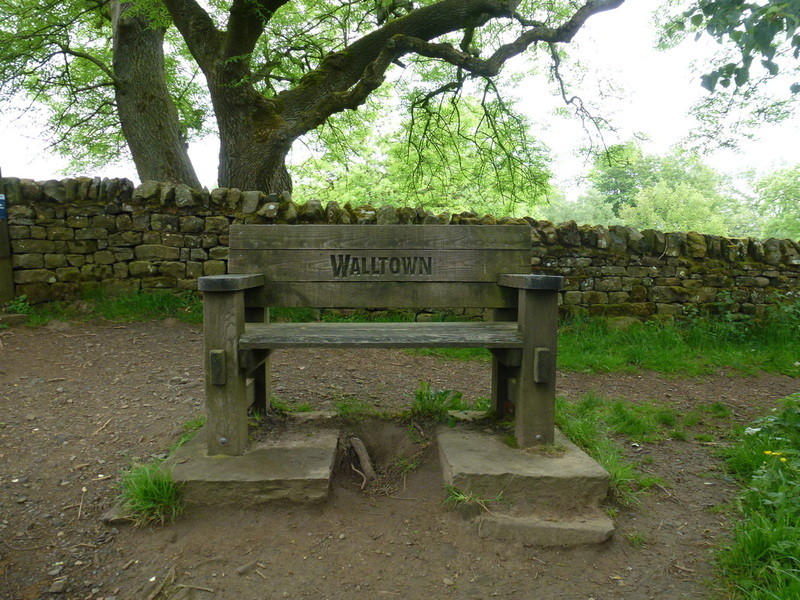 From Walltown Crags we passed several mile castles which are strong points where the wall garrison of approximately 20 to 30 soldiers would be billeted and were situated every Roman mile. We then reached a section of the wall that clearly came after the Romans before dropping down to the Car Park at Burnhead Quarry. From the quarry there was a steep climb up onto Cawfield Crags to a restored section of the wall before we dropped down to Shield on the Wall & Caw Gap. 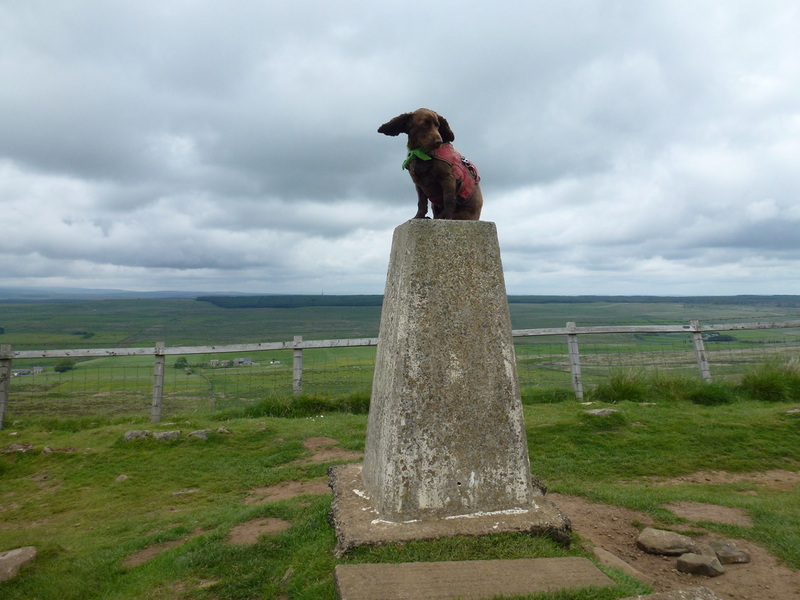 The route rose steeply again and reached the Trig Point on Winshields Crag, at 1132 feet the highest point on the wall. 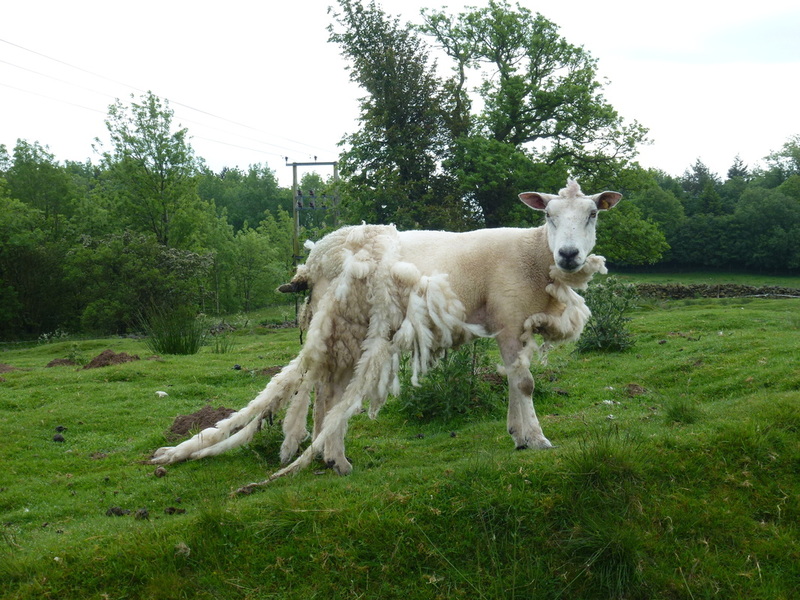 There now remained a short walk to the Car Park at Steel Rigg where Keith had parked his car. 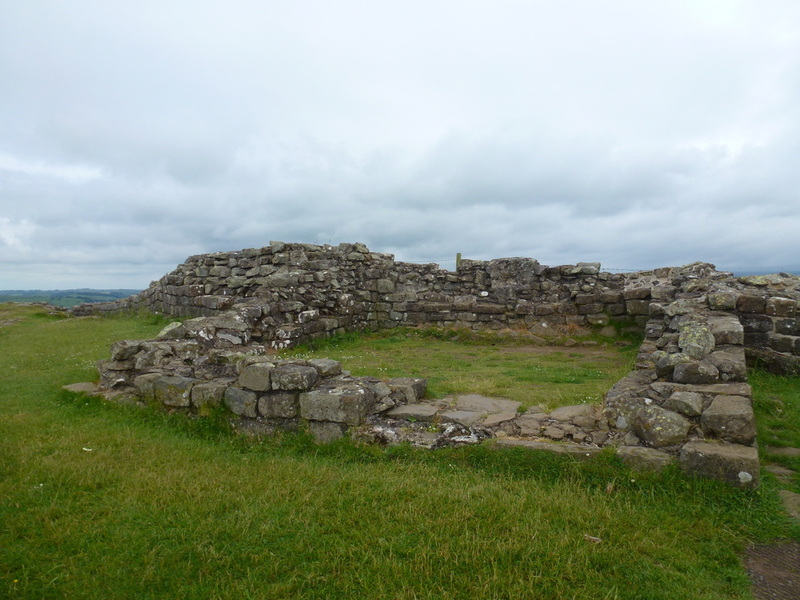 We only had a small glimpse of the wall up to this point and whilst we would see more tomorrow, we decided to take up Keith's offer of a lift, first to the Visitor's Centre at Once Brewed and then to Housesteads to visit the Roman Fort. ​Once Brewed & Twice Brewed?? The origins of the place names of these two areas are worth an explanation to those of you who may have seen them and wondered why the strange names. Apparently General Wade, best known for his destruction of many miles of Hadrian's Wall to the west of Newcastle to build his Military Road, found the local ale so weak that he ordered it to be "brewed twice" hence the name. When the Youth Hostel was opened in 1930, the YHA patron Lady Trevelyan remarked that she hoped her cup of tea would be "brewed once", unlike General Wade's ale. Whether these stories are true - who knows? 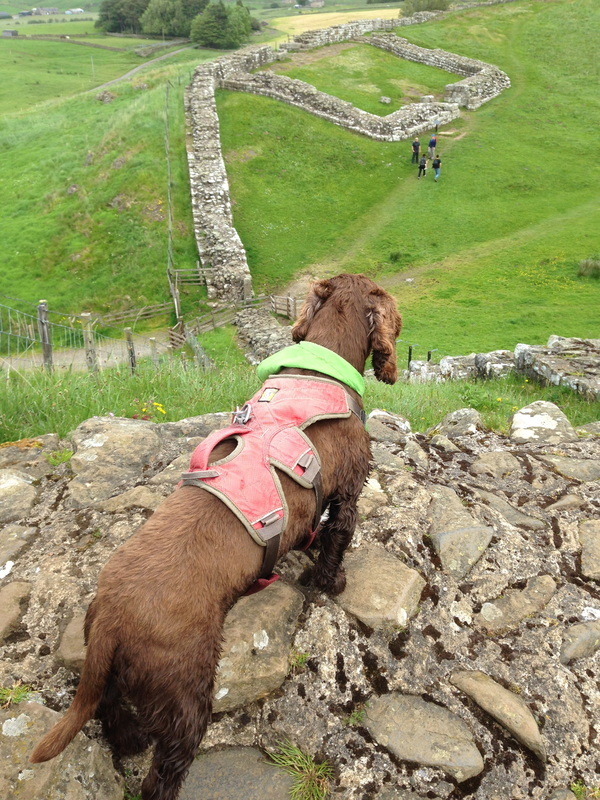 Saying our goodbyes to Keith we noticed that Housesteads, as expected was busy therefore rather than queue up for a ticket we looked at the fort from our ascent back up to the main wall path which to be honest was just as good as being inside the fort. 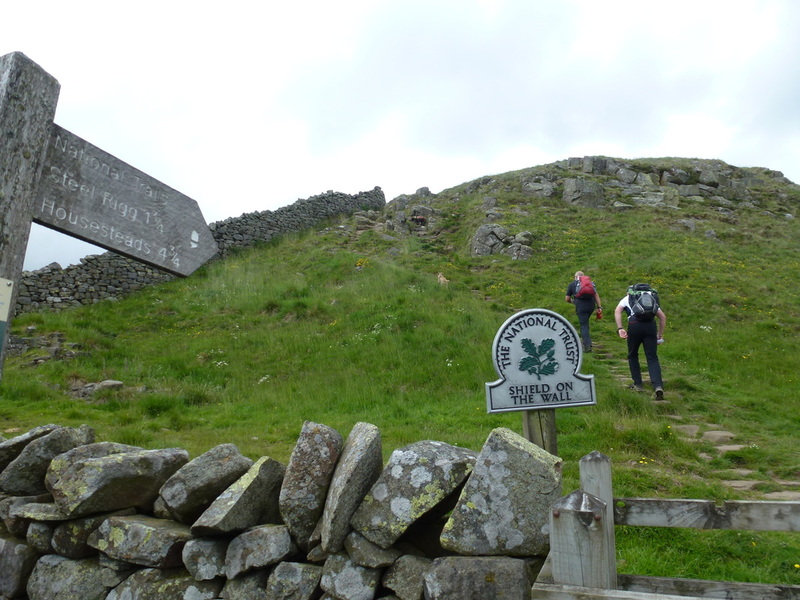 ​Therefore buoyed by saving a few quid we headed west to travel back to Steel Rigg. It was on this section that it started to rain heavily and we were thankful that we would be doing the majority of this section again tomorrow when the weather was supposed to improve. 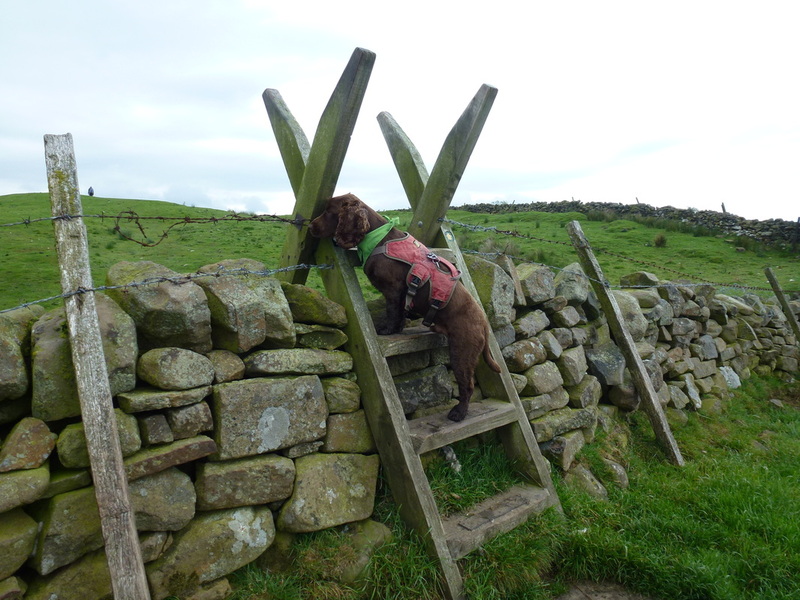 Back at Steel Rigg we were asked by a big Australian bloke "Where's this wall mate?" - we were stood right next to it therefore we didn't really know what he was expecting to see therefore we pointed at it and then left him and his bemused partner to it. From Steel Rigg it was now a simple question of walking the mile or so off route down a very quiet road to reach the farm at Saughy Rigg where we would be staying the night. 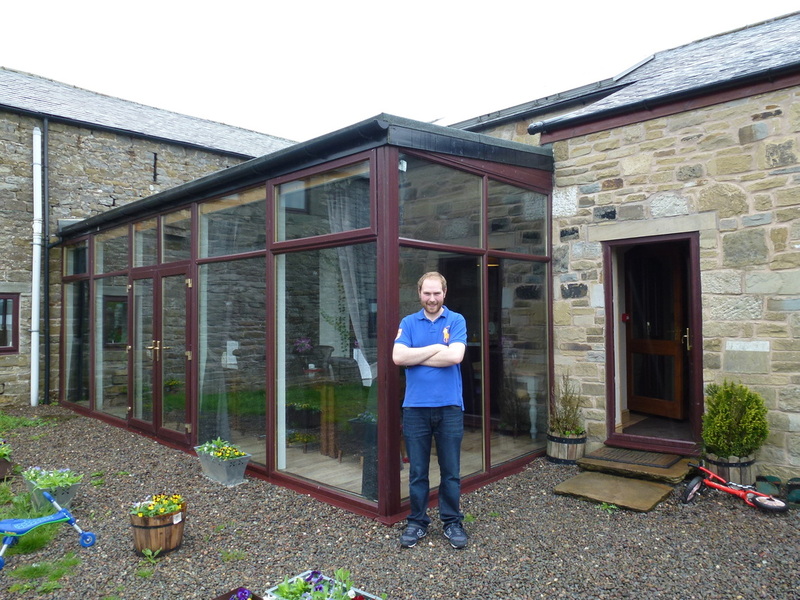 We were met at Saughy Rigg by the owner Sean who welcomed us and showed us to a really lovely room. He was clearly very busy and we left him to it - we were booked in for evening meal and bed & breakfast at Saughy Rigg therefore once we had showered we availed ourselves of the bar and watched the other guests arrive, including Ian & Rosie plus a group of excited Americans from Anchorage who were walking Hadrian's Wall. Dinner was taken with Ian & Rosie and was a very good meal, spoilt only by the loudness of the 14 or so American guests who unfortunately made themselves heard - c'est la vie!! 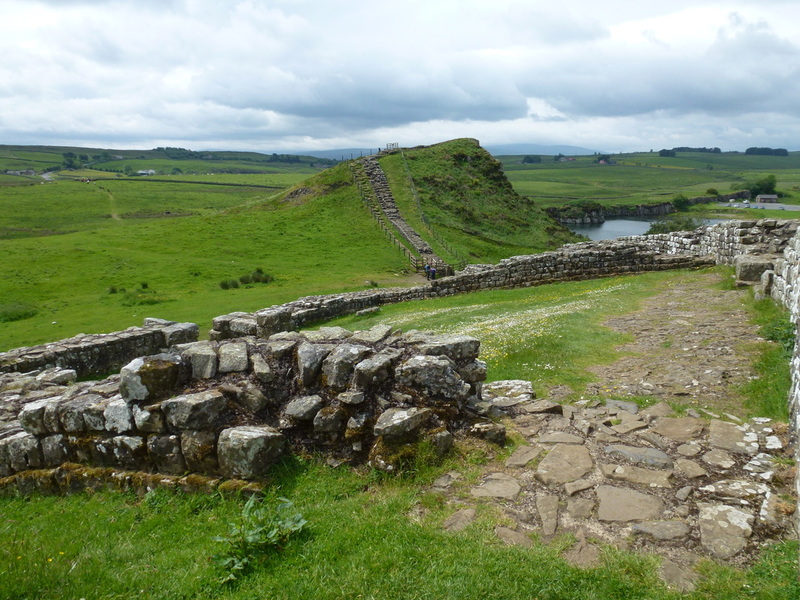 A short day mileage wise but such an enjoyable one - Hadrian's Wall did not disappoint and we looked forward to seeing more of it tomorrow. 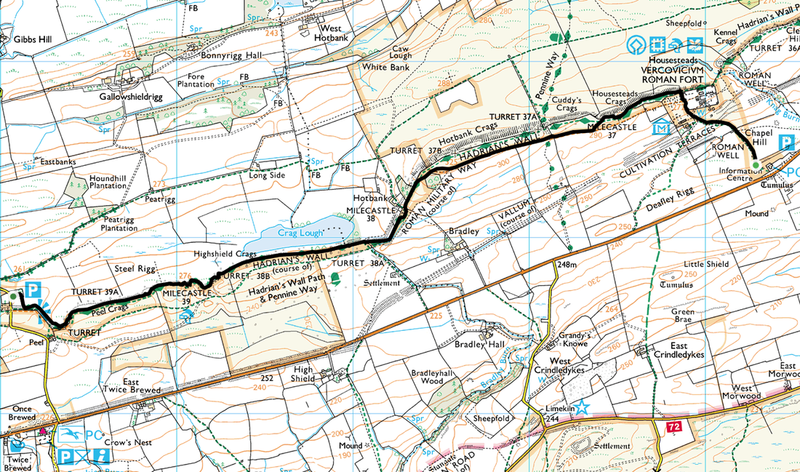 Run by the indomitable Sean, Saughy Rigg is off route by about half a mile from Steel Rigg Car Park. 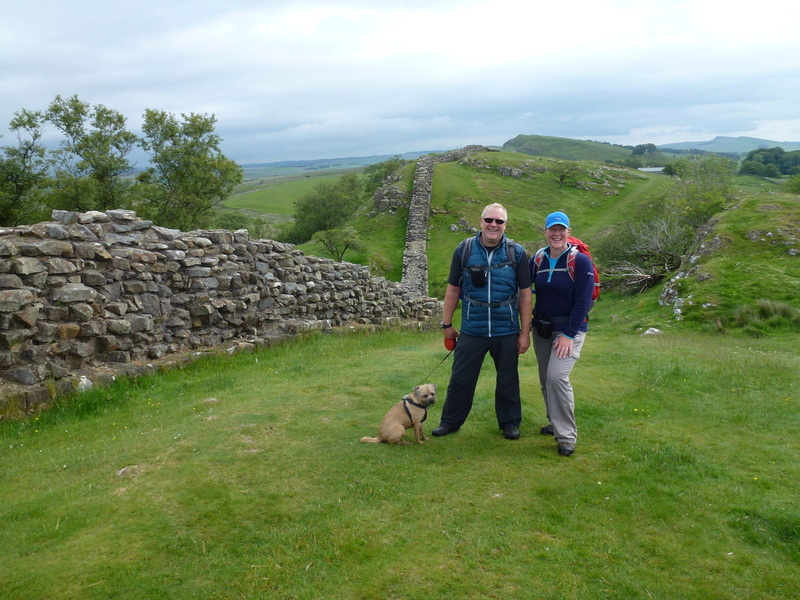 The B&B was busy with people walking Hadrians Wall however we enjoyed a very good evening meal and a pleasant stay here.